Mindfulness—once an ancient practice honed in Buddhist monasteries—is now a mainstream, evidence-based, secular intervention employed by trained health and mental health professionals worldwide. Research continues to show that mindfulness is an effective treatment for anxiety, depression, stress, pain relief, and many other ailments other such as burnout. But, Mindfulness can also be effectively used to help clients with other serious issues like: emotional eating and weight gain, smoking, insomnia, impulsive behaviours, and problematic habit patterns. This unique “Mindfulness Combo” workshop will take your current understanding of Mindfulness to the next level. 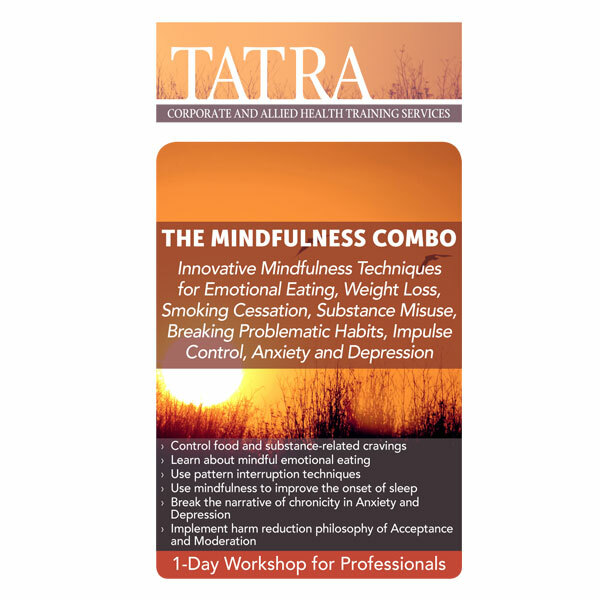 You will be able to broaden your understanding of mindfulness know-how techniques to assist clients, not only in achieving mood regulation or inner peace, but also in helping them to control food- and drug-related cravings, facilitate the onset of sleep, break away from self-pathologizing narratives, and to facilitate long-term change-process compliance. This is a fast-paced, highly experiential workshop with hands-on exercises that you will be able to implement in your practice the very next day. Dots & Spaces – also known as “Riverbank Attitude,” a metacognitive distancing technique designed to assist with impulse- and craving-control presentations; also useful in cultivating a stress-resilient identity for stress management and trauma inoculation purposes. Dr. Somov will present a number of practical techniques of awareness-building and habit-modifying practices for dealing with mindless eating, emotional eating, smoking cessation, drug and alcohol lapse prevention, difficulty falling asleep, chronic worry and dysthymia (low-grade depression).